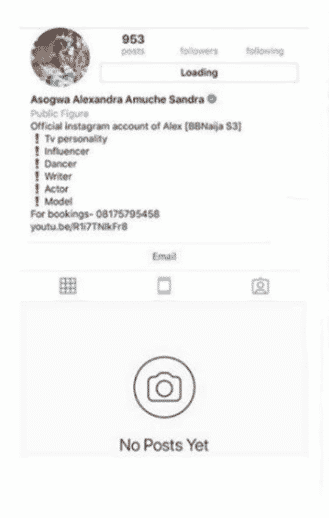 Alex Unusual Instagram Account Deactivated by Her after Reunion Show. Former Big Brother Naija 2018 housemate, Alex Unusual has deactivated her Instagram account a few days after the BBNaija 2019 Reunion show was concluded. Though, the BBNaija reality TV star has not started the reason for the action, however, a few people have connected to the backlash she received after it was revealed that she had s3x with ex-housemate Tobi Bakre. The s3x issue between her and Tobi was brought to light by Cee-C who claims she was told by Nina, who said the s3x happened at a hotel in south Africa shortly after the 2018 BBNaija edition was over. Alex however has denied the allegations, but Nina claims she was told by Miracle, her former strategic partner and love interest during the BBNaija 2018 show. A polygraph test carried out on her showed that all the while she and Tobi were going out, she still had feelings for Leo and wasn’t over him. She also denied having feelings for Leo during the reunion show. Stay connected for more updates from big brother naija 2019 reality TV show.